It is possible to change the visibility and the appearing text of the very basic (generic) selectors. 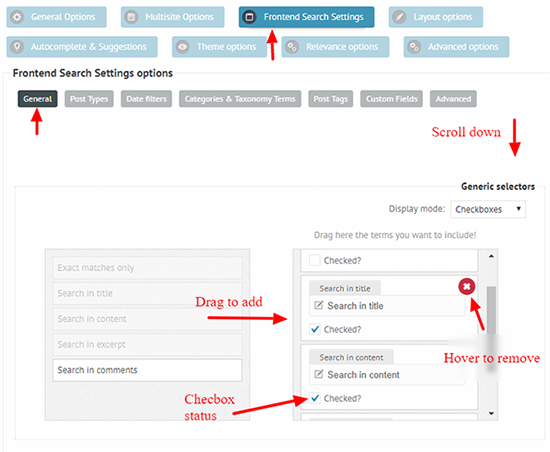 To access the list, go to the Frontent Search Settings -> General options panel and scroll down to the Generic Selectors option. To add items, drag them from the left side of the list, to remove them, simply hover over and click the red X button. On the right side of the list, the selector labels and the states ('Checked?' checkbox) are editable. If the Display mode is set to other than 'Checkboxes' (drop-down or radio), then the last 'Checked?' item is going to be the selected by default.